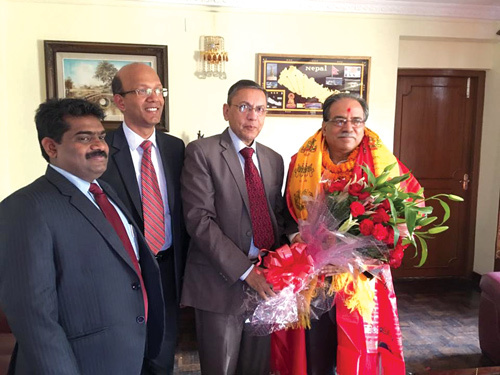 When Pushpa Kamal Dahal was elected a Prime Minister for the second time in August, Chinese Ambassador Wu Chuntai and Indian Ambassador Ranjit Rae rushed to Baluwatar to congratulate him. They tried to outdo each other not just to be first, but also competed on having a bigger bouquet (pictured top). 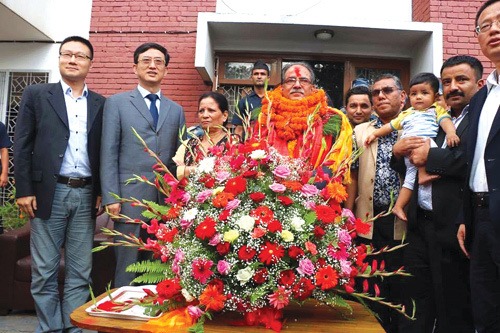 The Chinese beat the Indians in floral diplomacy both by being first, and also by having a bigger bouquet. However, the Chinese chrysanthemums and gladioli were imported from India and bought at a local market. Nepali culture places a premium on fresh flowers for garlands, and floral offerings to deities at temples. However, gifting imported ornamental flowers wrapped in plastic has become an epidemic. There isn’t a conference inauguration, or a welcome or departure ceremony at Kathmandu airport when dignitaries don’t have bouquets forced upon them. Two years ago, Prime Minister Sushil Koirala welcomed his Indian counterpart, Narendra Modi, with a bunch of fairly pathetic looking gladioli imported from Karnataka. Despite the cultural and religious demand for flowers at festival time and the growing demand for political and other functions, something is preventing Nepal’s floriculture sector to bloom and grow. More than a quarter of the consumer demand for cut flowers in Nepal is met through imports, mainly from India. Even the traditional marigold, the must-have flower for next week’s Tihar festival, needs to be imported. 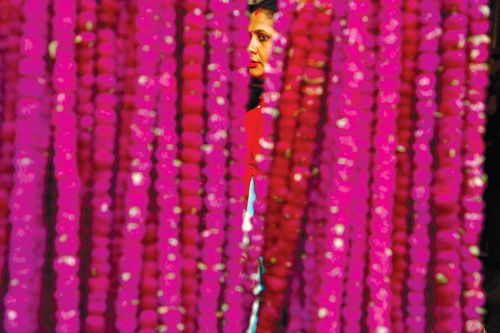 Already, 200,000 garlands worth Rs 6 million have been imported from Kolkata. Most flower shops in Kathmandu obtain cut flowers from India and Thailand, and flower seeds from Europe and the United States. The main demand, even in Nepal is on Valentine’s Day and during the winter season when local flowers are not available. Floriculturists say marigold demand is very seasonal and it doesn’t make sense to grow them just for one occasion. They say they need more investment if they target to produce and sell flowers only during Tihar, and this will increase the price for the blooms. Biraj Khadka of Khadka Nursery has been buying ornamental flowers worth Rs 1.5 million every month for his shop. “Selling flowers during Tihar is only possible because of the economy of scale that makes it feasible to import from Kolkata,” he adds. Nepal, however, seems to be self-sufficient in makhamali (Gomphrena), another traditional festival favourite at Bhai Tika because it doesn’t wilt. 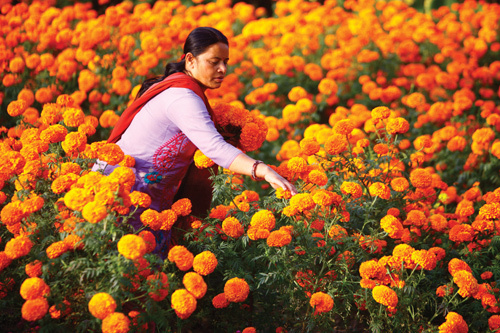 The demand in Kathmandu alone during Tihar festival is estimated at 900,000 marigold and 200,000 gomphrena garlands. The total turnover of the floriculture sector in Nepal last year was Rs 1.34 billion. There are more than 650 registered nurseries in the country, but only 47 hectares of land is used exclusively to grow flowers. The largest producers are Kathmandu Valley, Chitwan, and Makwanpur. Despite having an ideal climate for floriculture and a natural diversity of 6,500 floral species, the lack of infrastructure, investment and lack of government incentives have kept the industry back. Not only is Nepal importing more flowers, its exports of floral products sank from Rs 190 million to Rs 20 million in the last six years. Anil Acharya at the Ministry of Agricultural Development sums it up by saying that more investment is needed to boost self-reliance in flowers. But isn’t it his ministry that should be providing those incentives, we ask. Next time you decide to gift a bouquet to a colleague for a promotion or a partner on an anniversary, you may want to do a background check on where the flowers come from and how much fossil fuel was burnt in growing and transporting it to Nepal. The cut flower market is also dominated by India and Thailand during the winter season but the plant quarantine office at the airport doesn’t conduct laboratory test of those flowers. The flowers from Thailand are flown in as air cargo, while the ones from India come overland. Buying locally grown flowers can help in carbon saving but the authorities either reckon this issue as a trivial one or are unaware about the environmental costs of importing flowers. Anil Acharya at the Ministry of Agricultural Development agrees that locally produced flowers will boost the local economy and also be environmentally-friendly, but does not think the carbon footprint of imported flowers is significant.